I used it by connecting it to aluminum flexible hose, but the wind volume was small and the model selection was wrong. I did not know even the existence of a small built-in type, so I gained harvest. We plan to order a model that is 5 to 6 times the air volume again. This review is about item#37652833. Until now I have used Nitto but this product is exactly the same and the price is quite cheap, I can trust if it is an oriental motor, and I often use it in small motors elsewhere. This review is about item#06869037. 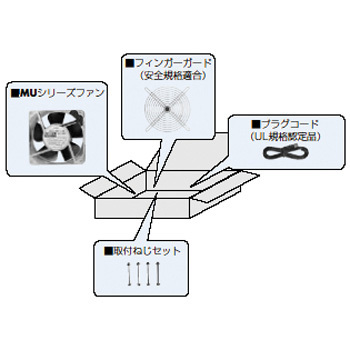 The exhaust fan of the controller of NC was broken and the operation became wrong, so I bought a fan of the same model suddenly. I decided to make a connector for the connection, but I was able to exchange it easily on arrival, so it was very helpful. This seems to be usable for a while. This review is about item#06869003.